What should I do about the langeh chuf of E'lokecha? My question really has two parts, would there be an issue of chok tochos? And if there is chok tochos here that means that it lost its tzura so then would I be allowed to erase it since it is l'tzorech tikkun? IF the big blot is outside the Kaf(as it appears) and seeing as the smaller blot is smaller than the regel of a yud, there should be no problem with erasure. That leaves the blot that is on the Kaf itself. From my understanding that you cannot erase. You could add ink to the rest of the kaf in order to widen it out to make it less noticeable. Regarding the small blot, should we be choshesh for the Rosh that a kol-shehu turns it into a heh? My understanding is that it has to be at least the size of the regel of a yud before there is a worry. Smaller than that, and it is not. 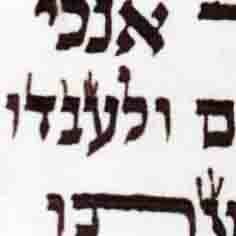 From the picture it seems that the small dot is smaller than the regel of a yud of the same writing. So there is no worries. R Michael do you have a source for that (not sure if you saw my comment below)? If the regel is less than a regel yud then even acc to MB who paskens with the Rama against the Rosh, holds it can be fixed through a Sheilat tinok. This means it can still have the tzura of a hey even with a regel pnimi less than regel yud. Otherwise it couldn't be fixed. Those seifim (especially s"k 26 that you didn't mention) prove what I was saying. The Halacha is that the regel pnimi needs k'mlo yud. Whether that means yud + regel or just regel is another issue. If the regel pnimi doesn't have k'mlo yud, the poskim pasken that it is Pasul. BUT - if its less than k'mlo yud AND a tinok reads it as a hey then it CAN be fixed to the correct Shiur. This means that its possible for a hey with regel pnimi less than k'mlo yud to have "tzurat haot" recognizable as a hey even if its Pasul as is. Therefore, a dalet, reish or kaf with a dot in it - even if its less than k'mlo yud, CAN still be Pasul as it turns it into a hey, even if that hey would be Pasul as is. Therefore, the reason one can erase a dot can NOT be only because its smaller than k'mlo yud. It has to be a combination of factors by which the letter is not turned into a tzura of a hey. Those seifim say that it has to be the size of the regel of a yud to matter. If it is the regel of a yud it doesn't matter how a tinuk reads it, it is a hey and it is possul. The entire letter would need to be erased, or in this case you would not be able to fix it, and it would just be possul. Only if it is smaller than a regel of yud can you have a hope of fixing it. "Those seifim say that it has to be the size of the regel of a yud to matter." I don't think this is correct. The seifim do not say if its less that Shiur yud its insignificant. They say its Pasul as a hey. Very big difference. In fact, if its less than Shiur yud it DOES still matter leinyan tikun through a Sheilat tinok. That means it would still have tzurat haot (and therefore would be very far from not mattering). "If it is the regel of a yud it doesn't matter how a tinuk reads it, it is a hey and it is possul. The entire letter would need to be erased, or in this case you would not be able to fix it, and it would just be possul." "Only if it is smaller than a regel of yud can you have a hope of fixing it." True. But the wording of your first response made it sound like you we're saying *the* reason why it can be erased is because its smaller than a yud - ie the only thing to determine if it can be erased is its size. This I think is not correct because size is a factor but its not the only one. There can be many instances where its smaller than Shiur yud and still assur to erase, which means your statement allowing to erase if its smaller than Shiur yud is not totally correct. That's all I was attempting at - sorry if this has become more a give and take of semantics, I just thought it was an important enough point worth confirming. 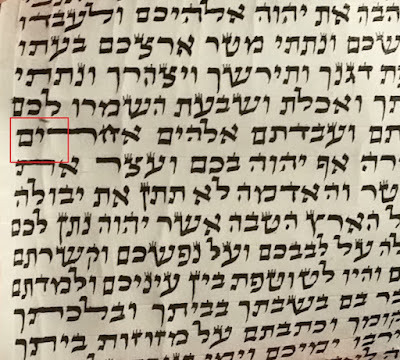 seeing as the smaller blot is smaller than the regel of a yud, there should be no problem with erasure. There is a big different between shiur of a Yud(which is a full kulmus) and the regel of a yud(which is roughly a third of a kulmus). Shiur of a yud anywhere within a reish or kaf would possul it without safek, no matter what a tinok says. Regel of a yud would also possul it without question). Smaller than than a regel of a yud(such as a tag) will not automatically possul the letter, and in most cases can be erased l'chatchila. Dealing with this situation in particular, you have what else to rely upon as well. Rav Shlomo Kluger writes that a the letters on the end of Elokei, such as this kaf, are only forbidden to be erased m'd'rabbanan, and if one can do so in such a way that the shiur of the ot remains, then it may be done in the case. Rav Halberstam ZTz"L ruled that the shiur of a Kaf sofit was four kulmusim. In this particular case, according to Rav Kluger we could erase the regel of the kaf until the lower part of the blot within the yerech. Which would then put that small dot(and the bigger one too as a matter of fact) outside of the kaf, and thus be able to erase them before we reform the lower part of the kaf. 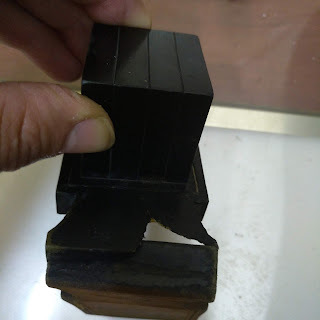 Rav Ovadia Yosef in Yabia Omer and Chazon Ovadia(S"T U"Tefillin) writes that while we do not rely on this particular opinion, it leave what to rely upon in order to erase dots that are smaller than the regel of a yud without the need to even ask a Shaalat Tinok. I think we are having a miscommunication. Best leave it here...I think we agree on most points. As I understand, even for the Rosh there's still a limit - otherwise אין לדבר סוף. A tiny speck I don't believe would be kosher by the Rosh. Nor would a tiny dot on the right side of the letter. But it depends on the individual situation. I think the Rosh's limit is subjectively something that looks like a nekuda. I'm not touching the judgment call on that one, nowhere near enough shimush. Re the blot on the yerech, once teh MB is machshir I wouldn't risk causing worse problems if this were a very small pair of tefillin or similar. I think you'll find the blurriness of the photo is making the dots look bigger than they are. I also think the picture is on a slight angle. If it was straight, the bigger dot may be more under the gug than it appears.